When P. T. Barnum met twenty-five-inch-tall Charles Stratton at a Bridgeport, Connecticut hotel in 1843, one of the most important partnerships in entertainment history was born. With Barnum's promotional skills and the miniature Stratton's comedic talents, they charmed a Who's Who of the 19th century, from Queen Victoria to Charles Dickens to Abraham Lincoln. Adored worldwide as "General Tom Thumb," Stratton played to sold-out shows for almost forty years. 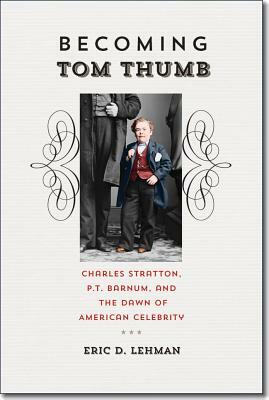 From his days as a precocious child star to his tragic early death, Becoming Tom Thumb tells the full story of this iconic figure for the first time. It details his triumphs on the New York stage, his epic celebrity wedding, and his around-the-world tour, drawing on newly available primary sources and interviews. From the mansions of Paris to the deserts of Australia, Stratton's unique brand of Yankee comedy not only earned him the accolades of millions of fans, it helped move little people out of the side show and into the lime light. ERIC D. LEHMAN teaches travel literature and creative writing at the University of Bridgeport. He is the author of seven books, including Insiders' Guide to Connecticut and Bridgeport: Tales from the Park City. His essays, reviews, and stories have appeared in dozens of journals and magazines.